-case: maple plywood from HD… Do not buy this product! It’s horrible. A few bucks cheaper than birch but loaded with voids and in some pieces it wasn’t even glued. Do not buy! 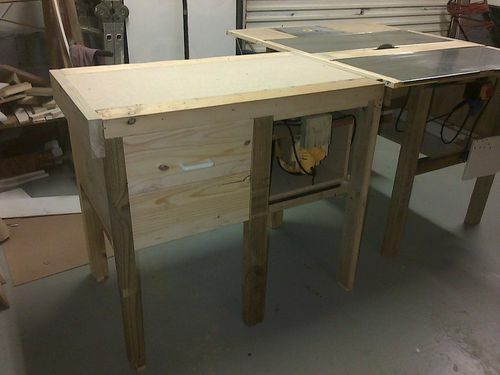 -drawers: kreg jigged with hardboard bottoms. I used the $7 – 24” slides at HD. I’m pleased with them. -top: torsion box with sandwiched mdf and hardboard. I wrapped it in poplar with a roundover. -electrical: wired three outlets and one switched outlet for the air compressor. -casters: 6 – 3” 200lb load rollerblade wheel style from harbor freight. Quite sufficient. A couple notes… I can’t stand my air compressor so I attempted to dampen the sound with the some foam board. I might end up going with Sheetrock. The top is detachable. My ridgid is 37” high and it appears most cabinet saws are 34” high. So when I bite the bullet on a jet cabinet – I can put a new thinner torsion box on it. Lastly, the miller lite bottles with the caps are perfect for the shop… Keeps the dust out. my favorite way to test whether my torsion box is level is to use the “cold can of beer” test. How many beers does it take to make it look level? -- I'm a lumberjack, and I'm okay, I sleep all night and I work all day. -- Why doesn't Whole Foods sell livestock? Now I wish – once again – that I had a bigger shop. Not only does this look great, but it is also a great use of space. Thanks for sharing! This looks great! nice work. How well does the foam insulation work for your air compressor? I was thinking about doing something similar for my shop vac. Like it! Ill take a beer please. I’m thinking about making a smaller version of this (3’ x 4’) to fit in my garage shop. The table I use now has nothing underneath it and my compressor is sitting under there making a bunch of noise. I need to up the storage capability of that space and dampen the noise like you mentioned. “great upgrade” is a good description. That table looks good well before beer kicks in. Thanks for posting. Very nice job. Great storage also. -- Darrel..."The biggest threat to 'good' is 'better'. Stunning outfield table. Mine will need a lot more work, and a few more beers, to look that good.